March 12, 2012 0 comments on "Jello Easter Eggs"
These Jello Easter eggs are a fun easy treat to make for your kids or grandkids for Easter. Let the kids pick out their favorite flavors of Jello and let them help make them. Mix all ingredients well. Spray the inside of plastic Easter eggs (the kind you put candy and toys in for your kids to find at Easter) with cooking spray. 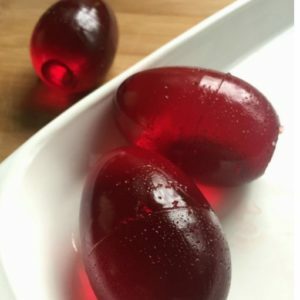 Dip eggs into the Jello mixture to fill. Refrigerate until set, then remove the plastic from eggs. Makes 6 to 12 eggs depending on the size of the plastic eggs. Fun! (Note: You can also purchase this fun Jello Jigglers Easter Mold Kit from Amazon).